Oriental Rug Salon is SW Florida’s most trusted source for the care, restoration, and repair of hand-knotted and tufted area rugs from around the world. We are the “cleaner of choice” to many of our areas leading interior designers, rug collectors, insurance companies and rug owners who cherish their hand-woven, tufted and machine made area rugs. In fact, we regularly receive rugs from around the United States whose owners are desirous of a thoroughly exhaustive hand cleaning or professional repair by industry recognized experts. Our restoration process is performed by hand, and each area rug is cleaned one at a time, in a bath explicitly prepared for that textiles cleaning needs. Our technicians are highly experienced and certified and supervised by a qualified rug master experienced in all textile types. Each rug is inspected with Xenon and high-intensity lighting to uncover hidden pockets of bacteria, urine, moth activity and other contamination issues. The inspection process is followed with a thorough dusting designed to dislodge deep-set soils, sand, dust mites and pollen that are out of reach of even the most powerful vacuum cleaners. The area rug receives a 24-hour dye migration test to determine the stability of the rugs dyes. If we discover the textile may “bleed,” precautions are taken to protect the rug prior to washing. 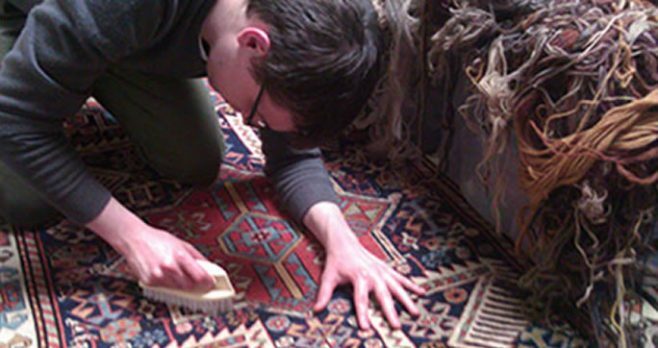 Over 95% of all wool and silk area rugs can be fully submerged washed by a technician who is an expert in submersion techniques. For those rugs that are candidates for rug submersion, they are bathed in a wash by themselves using an allergen-free cleaning solution approved by the Carpet & Rug Institute. Both sides of the rug are hand washed. The bath is drained, and the rug is rinsed in a pH conditioned solution using cold water. This rinse will ensure no residues are left behind and that the fibers are fully conditioned. Upon completion of the rinse, the area rug is transferred to an air table for drying. Once the rug is verified dry with a moisture meter, it is inspected by the shop foreman. If the area rug meets our approval, we lightly deodorize with an allergen-free deodorizer, wrap in acid paper and prepare for delivery. Oriental Rug Salon is a Certified Partner with the prestigious Institute of Inspection, Cleaning and Restoration Certification (IICRC) and the International Carpet & Rug Institute (CRI). In addition, we are A+ rated with the Better Business Bureau and a five-year-in-a-row-winner of the coveted Angie’s List Super Service Award. Unlike many area rug “cleaning companies” who use impersonal, mechanical wash tubs to batch wash many rugs at the same time, our individualized, hands-on approach allows for the safest, deepest clean possible. If Oriental Rug Salon can ever be of service to you, or if you have any questions about your Oriental, Turkish, Persian, wool or silk area rug, please feel free to speak with our rug master at any time. For more information about our services, please feel free to visit us online at www.OrientalRugSalon.com or give us a call at 239-424-8171 – Collier and Lee County or 941-893-1655 Punta Gorda, Port Charlotte or Sarasota Florida.